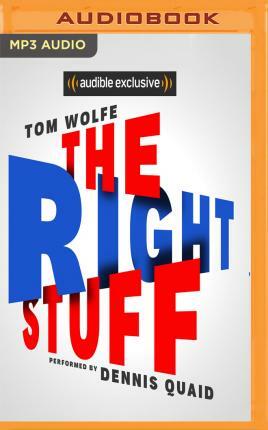 Tom Wolfe is the author of more than a dozen books, among them such contemporary classics as The Electric Kool-Aid Acid Test, The Right Stuff, The Bonfire of the Vanities and A Man in Full. A native of Richmond, Virginia, he earned his B.A. at Washington and Lee University and a PhD. in American studies at Yale. He lives in New York City. Dennis Quaid is renowned for his distinct portrayals in both comedic and dramatic roles over the past forty years. Quaid can next be seen in Roadside Attraction's faith-based film I Can Only Imagine which will be released on March 16, 2018. Dennis most recently stared in Crackle's auctioneering drama The Art of More on which he also served as an executive producer. On the big screen, he was recently seen starring in Universal's A Dog's Purpose as well as in the fact-based drama Truth. He will next begin filming the third season of the BAFTA award-nominated television series Fortitude and recently completed production on Lionsgate's Kin with James Franco. Quaid began to gain attention in the late 1970s for roles in such films as Breaking Away before gaining public and critical acclaim for his role in the 1983 release The Right Stuff. Other notable credits include The Rookie, The Day After Tomorrow, Traffic, Vantage Point, Frequency, The Parent Trap, and Soul Surfer. For his role in Todd Haynes' Far from Heaven he won the New York Film Critics Circle Award for Best Supporting Actor, the Chicago Film Critics Association Award for Best Supporting Actor, the Online Film Critics Society Award for Best Supporting Actor and the Independent Spirit Award for Best Supporting Male. In 2010 he was nominated for numerous awards including a SAG Award(R), an Emmy(c) and a Golden Globe(c) for his portrayal of Bill Clinton in the TV Movie, A Special Relationship.